from our Liqueur Tasting Collections. Liqueur originated in the early Middle Ages, when monks soaked salubrious herbs, oils of dried plants and herbs in alcohol. To make the extract drinkable after this proces, a lot of sugar was added. It was believed that these Liqueurs were medicinal and could cure all kinds of diseases. Nowadays, Liqueur is produced by the extraction of flavours and smells from seeds, herbs and fruit peels. These ingredients are put into bags, which are then hung in a mix of water and alcohol. The duration of this process can vary from three days up to six weeks, after which the mixture is rested and sugar and neutral alcohol are added. Liqueur can be subdivided into different groups. This subheading can be applied to ingredients used and added after or during the resting period. As the name implies, Fruit Liqueur is a Liqueur based on fruits. Orange is often used in these Liqueurs, which are characterised by a high sugar and alcohol content (minimum 15%). This popular Liqueur variety often serves as a basis for mix drinks or exotic cocktails. The base of the Herbal Liqueur consists largely of herbs, such as Anise, Cinnamon, Rosemary, Mint or Vanilla. Nuts, coffee beans or cocoa beans are at the heart of this Liqueur style. Famous Nut- and coffee Liqueurs are Amaretto and Tia Maria. 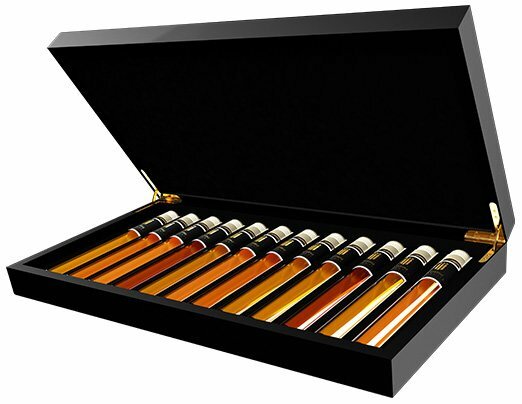 The Crème Liqueur has the characteristic of possessing a very high sugar content ( a minimum of 250 grams per litre). Crème Liqueur is an excellent addition to the dessert. Liqueurettes are Liqueur-like products with an alcohol content of less than 15%. Because of their low alcohol content, these Liqueurettes can simply be sold in the supermarket, as opposed to Liqueurs, which can only be sold in a liquor store. Liqueur has many well-known brands, which of course are also available at Tasting Collection, below a selection of the Liqueurs that Tasting Collection has to offer. In Roman times there was already a kind of Liqueur in Carthage, Liqvor Mirabilis, which meant 'miraculous liquid'. That Elixer has been the source of inspiration for the recipe of Licor 43, brought to market in 1946 by the family Zamora. Citrus fruit, vanilla and spices form the core of this Liqueur, which, according to its makers, contains exactly 43 ingredients. The Liqueur is mildly sweet with clear citrus tones. Limoncello is an Italian Liqueur, with an alcohol content between 25 and 30 percent. Limoncello is mainly produced in the south of Italy, but also, for example, in California (United States). Limoncello consists of ingredients such as lemons, pure alcohol, sugar and water. This Liqueur is usually drunk cold after a meal, but can also be combined with Prosecco or Tonic. Amaretto, a pure Italian Liqueur made from almond seeds. Amaretto has a mildly bitter taste, and also means 'a little bit bitter' in Italian. This Liqueur can be drunk on its own, as a mix with coffee or in cocktails. Cointreau is a so-called 'triple sec', which is a colourless, strong Liqueur with orange taste. The Cointreau brand is produced in Saint-Barthélemy-d'Anjou, France. Triple Sec is made from dried orange peels of several kinds of oranges. These peels are soaked in alcohol, which results in the peel giving off its specific taste. Cointreau can be drunk as an aperitif or digestive, but can also be used as a component for a number of tasty cocktails. The base of Drambuie is Scottish Whisky, herbs and heather honey. This Whisky Liqueur has been produced on the Island of Skye since 1746. The name Drambuie is derived from the Scottish 'An dram buidheach', which means 'a drink that satisfies'. The golden combination of Grand Marnier is Cognac and Orange. The recipe for the Grand Marnier was devised by Alexandre Marnier-Lapostolle in 1880. For the Grand Marnier, only special oranges of the Bigaradia variety, originating from the Caribbean, are used. These Bigaradia Oranges are picked when they are not yet ripe so that the peel still contains the oil that gives off the most of their aromas. Orange peels are sun dried and added to alcohol, in which the peels will soak. Later this is combined with the Cognac and certain herbs, with the final result being the Grand Marnier. Tia Maria or "Aunt Maria", is the name of a Jamaican coffee Liqueur based on Jamaican rum. The main ingredients of Tia Maria is the coffee bean Blue Mountain, Vanilla sticks, spices and Jamaican Rum. This coffee Liqueur can be drunk on its own or with ice cubes, but also Tia Maria fits well with coffee or dessert.